1. SARAH PHILIPS was born in Jan 1823 in Davidson Co TN. She died in Jul 1823 in Davidson Co TN. 2. MARY L. PHILIPS was born on 31 May 1837 in Davidson Co TN. She died in Sep 1919in Buried at Philips Cemetery on Wharton Lot. She married JOHN FELIX DEMOVILLE on 21 Nov 1854. He was born about 1837. 3. MILBRY CATHERINE PHILIPS was born on 08 Feb 1833 in Davidson Co TN. She died on11 Sep 1863 in Sylvan Hall, Nashville, Davidson Co TN. She married WILLIAM PERKINS HARDING on 05 May 1853 in Nashville, Davidson Co TN, son of Thomas Jefferson HARDING and Elizabeth Waller Bosley. 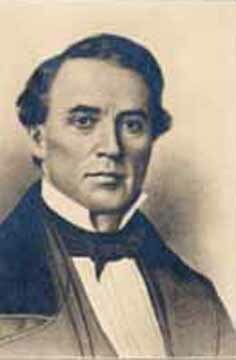 He was born on 18 Sep 1822 in Nashville, Davidson Co TN. He died on 16 Sep 1903 in Sylvan Hall, Nashville, Davidson Co TN. 4. CAPT. JOSEPH PHILIPS was born on 11 Nov 1838 in Davidson Co TN. He died on Mar 1920 in Davidson Co TN. He married ANNE COZART on 13 Jul 1864, daughter of William Mangum and Sarah Murray. She was born in Columbus, MS. She died in 1882. 5. DANIEL DWYER PHILIPS was born on 29 Dec 1840 in Davidson Co TN. He died on 01 Aug1911 in Nashville, Davidson Co TN. He married MARY ELIZABETH FINN on 10 Nov 1868, daughter of Lawrence FINN and Elizabeth Clay DUVAL. She was born about 1844 in KY. She died on 17 Jan 1915 in Nashville, Davidson Co TN. 6. MARGARET PHILIPS was born on 11 Sep 1842 in Nashville, Davidson Co TN. She diedon 18 Nov 1909 in Nashville, Davidson Co TN. She married RUFUS KING POLK on 28 Apr 1881 in Near Nashville, TN, son of George Washington POLK and Sally Louisa HILLIARD.He was born on 31 Oct 1843 in Maury, Tennessee, USA. He died on 27 Aug 1902 in Nashville, Davidson, Tennessee, USA. 7. WILLIAM DUNCAN PHILIPS was born on 03 Sep 1846 in Davidson Co TN. He died on 3 Jul 1862 in Davidson Co TN at the age of 15.
this 1871 map by Wilbur F. Foster. Source: History of Davidson, County, Tennessee, with Illustrations and Biographical Sketches of its Prominent Men and Pioneers (Clayton, 1971), p. 413. William D. Philips was born on the 10th of' June,1804, and died on the 15th of June, 1879, at his farm and residence, six miles north of Nashville, Davidson Co., Tenn. where he was born, raised, lived, and died on the well-known farm on which his father lived and died,—the" Philips" place. His father, Joseph Philips, was an early settler, and migrated in 1791, with his wife, Milbry Philips, from Edgecombe Co., N. C., to Tennessee. His ancestry for several 'generations, both paternal and maternal, were natives of Edgecombe province under the Colonial government. William D. Philips was respected and esteemed for his solid and many virtues by all who knew him. His life was wholly a private life; he never held or sought office, but gave his time, mind, and life to the occupation of farming and agriculture. He inherited from his father about one thousand acres of land and several families of slaves. He was not of age when he came into his possessions and government and control of his farm. His education was as good and liberal as the times allowed; for a time a pupil of the Rev. Thomas B. Craighead. He was not a man of letters or literary taste, but of active life and deeds his film and its laborers were well governed and conducted; he gave it his care, skill, and judgment, and it was his pride and pleasure to the day of his death. 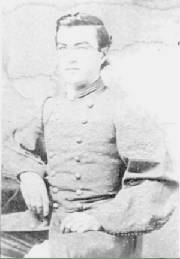 William D. Philips married early in life, as soon as of age, Susan P. Clark, daughter of Thomas A. Clark, of South West Point, East Tennessee, a sister of James P. Clark, of Nashville, which led to a close, intimate friendship between these persons, which was that of brothers, and lasted as long as life, and continued to exist between their families after the death of Mrs. Philips, whose married life was of short duration, and died without issue. "In 1828, he [William D. Philips] married Eliza Dwyer, daughter of Daniel Dwyer, a merchant of Franklin, Tenn., a genial Irish gentleman, she herself being a native of Ireland, and a type of the most beautiful Irish lady, cheerful, warm, and cheering all brought within her circle, always kind, cordial, and gentle. She became a model farmer's wife, serving and in person directing the household and its affairs in-doors. All went well under her gentle but firm control and management. She was happy herself, and always cordial to her husband's relatives,--a large connection and frequent visitors. William D. Philips was not a common, but an uncommon,man in his person and character. He had a good physique,was in stature six feet high, well formed, and developed in his person by 'active life in the open air. He was a practical man wholly, dark hazel eyes, auburn hair, impulsive, quick in his movements, and without impulsive temperament, yet self-controlled in a high degree. He went to bed early, rose before the sun, and regular in his habits, a very moderate eater at all of his meals for his active life and habits. He was very industrious and diligent in the management of his farm, and "All over it his foot-tracks were to be found and the effects of his eyes were to be seen." He was always glad to have his relatives, friends, and other persons to visit him, and made them welcome at an abundant old Virginia or North Carolina table spread with the best. He was not an avaricious or ambitious man, had high self respect and pride of character, had plenty, determined always to have plenty and to spare, and gave with unstinted generosity when real charity was demanded. Never sought to be popular in a popular sense, but placed a high value on character; had great pride of character; desired to possess the good will and respect of his fellow-citizens, but never sought it directly. There was not a trace of guile or deceit or meanness in his nature or character; in fact, lie despised all deceit, hypocrisy, and sham so much that probably it sent him in the other direction. It made him seem abrupt, harsh, arid short in his speech and manners. He repulsed in manner, but always gave when a case was presented. He always gave, but there as not seemingly grace in his manner; perhaps there was an imperiousness of slavery and master in his manner of which he was not conscious, and which is in the spirit of the institution itself, and from which no large slave-owner was exempt, not even Washington himself. Notwithstanding this manner outside, there was in his heart much real, genuine, warm, kind feeling and humanity. Many anecdotes are told to illustrate this kindness of his nature and seeming unkindness of manner. His good wife understood him, and his sterling qualities were known to her. She respected and loved him, and, though different in manners, they lived a long life of entire harmony. He knew his wife, and fully appreciated and loved her gentle, winning ways and character. When she died, as she did some years before his death, her death brought home upon and within him a deep, inconsolable grief, which went with him to his grave. This man, the product of our times and society, was at the core of hint a sound man, a real, genuine man, no sham or hollow man wearing the mask of goodness to cover up a false and selfish nature. On Monday evening, June 16, 1879, his mortal remains were deposited in the family burial-place on his farm, and now sleeps with his father, his mother, and his beloved wife, mother of his children, and two children, on the farm upon which he was born, raised, lived, and died, and which he loved so well. He was the father of seven children by his wife Eliza Dwyer, of whom two sons and two daughters survive him. His sister, Mrs. Martha Martin, the last of a large family of brothers and sisters, still lives, at the age of eighty-nine years, beloved by all who know her. The 1840 U.S. Census lists Peter Bashaw in the 19th District. The Davidson County Deed Book I, 419: The deed of Peter Bashaw's 78 acres sets his western boundry in line with the eastern boundary of the hext householder listed, Wilson White. His west boundary appears to have been in the middle of the Louisville Branch Turnpike (now Dickerson Pike), although the deed does not so specify. 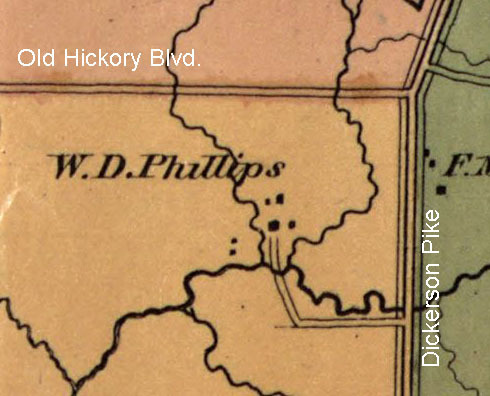 His neighbor to the west was W. D. Philips, a resident of the 20th Civil District. Clayton, Davidson County, biological sketch on page 413, mentions that William D. Philips was for a time a pupil of the Rev. Thomas B. Craighead who became President of The Academy of Davidson County (later moved down town as Davidson College) which was opened in 1786. I came across the picture below in a microfilm reel at the TN Archives. It was in the Frazer, Sadie Warner Papers - Roll 1190-12. 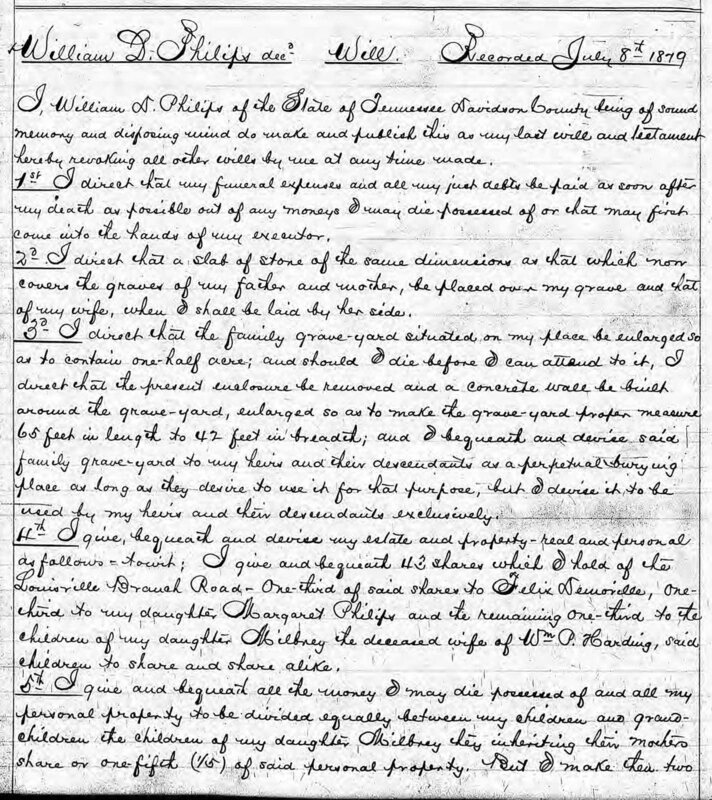 The below will of William Duncan Philips was obtained from Ancestry.com microfilm records of Davidson County Court files. In the will, William instructed his executor (son Joseph Philips) to enlarge the present grave-yard on his place and remove the existing enclosure and replace it with a "concrete" wall, enlarging the grave-yard to an area of 1/2 acre with dimensions of 65 feet long and 45 feet wide. Today the cemetery is enclosed in a rock wall with dimensions of 58 feet in length and 49 feet in width on the outside of the wall. If William meant inside dimensions, then one would have to compare the current dimensions as 54 feet in length and 45 feet wide. The width would agree with his request, but the length would be 11 feet short. However, the area of the cemetery inside the wall is only 2730 square feet, or 1/16 of an acre and not the 1/2 acre requested by William in his will. Without more information about the makeup of the original enclosure, it is difficult to speculate whether Joseph complied with his request to enlarge the cemetery or not. The wall is not "cement", but it is built from large limestone rocks, the same material used in cement. 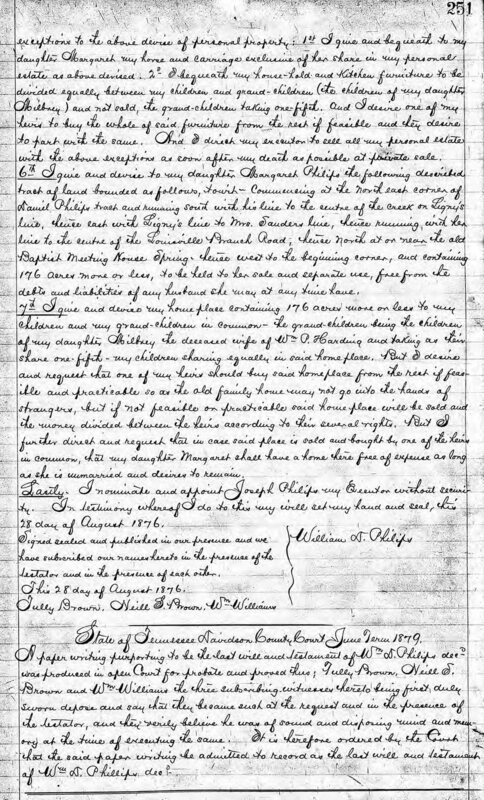 Joseph Philips, grandfather of Captain Joseph Philips, was born in 1763, in Edgecombe county, North Carolina, where his parents were life-long residents. He was a rebel, and during the Revolutionary War fought for independence. Another family named Phillips fought in the same war for the Crown, being tories, and this so incensed Joseph Philips that he dropped one of the “l’s” from his name, changing it to its pres­ent form, not wishing anyone to suspect that he might possibly be a kinsman of the tory Phillips. 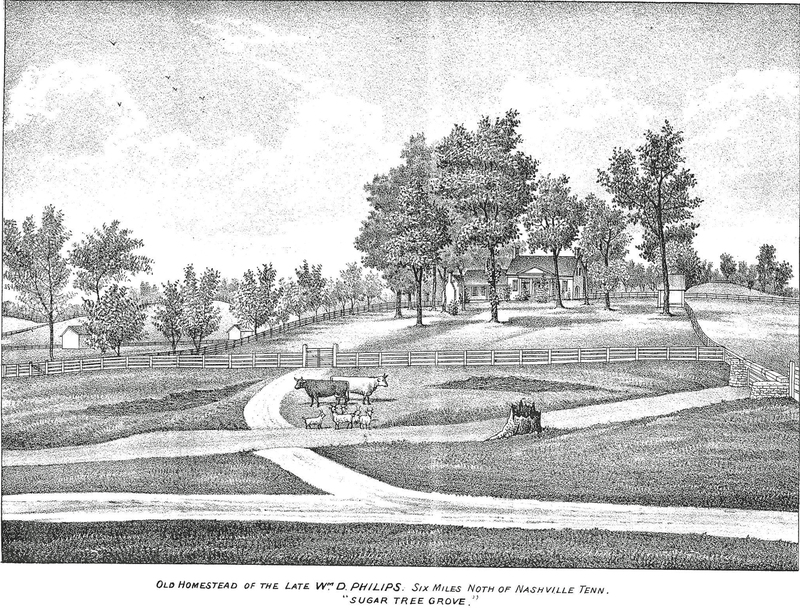 Shortly after his marriage, in 1791, Joseph Philips started with his wife for the wilds of Tennessee. They made an overland journey with teams, following a blazed trail a large part of the way, bringing with them their household goods, and all of their stock and slaves. He located in Davidson county, which he had previously visited, and which was then very thinly populated. He bought a tract of land lying six miles north of Nashville, and began the establishment of a home, his first step in that direction being the erection of a log cabin which he and his family occupied until 1804, when it was burned, the fire occur­ring in March of that year. He then burned a kiln of brick, and erected a substantial house, in commodious colonial style, using whip-sawed timbers in its construction. This was the first brick house built in David­son county, and is still standing in good condition, and a part of the original log barn, built in 1791, is also standing. When he located there Nashville was but a hamlet, and for more than half a century after­ward there were no railroads in the state. He improved a fine homestead, and with the help of his slaves was there engaged in general farming until his death in 1818. A part of this farm is now owned by his grand­son, Captain Joseph Philips, of whom we write. Joseph Philips married in about 1784, in North Carolina, Milberry Horn, who was born in Edgecombe county, that state, where her parents were pioneer settlers. She died on the home farm, in Davidson county, Tennessee, in 1849. They reared seven children, as follows: William Duncan, Henry, Sarah, Margaret, Charlotte, Martha, and Mary. Henry died at the age of seventeen years. Sarah married William Williams, and Margaret married his brother, Joseph Williams. Charlotte was drowned when a girl in the Cumberland river. Martha married Thomas Martin, and Mary became the wife of Jesse Wharton. William Duncan Philips spent his entire life of seventy-five years on the old homestead, which became his by inheritance, and during his active career carried on farming with the assistance of slaves. He was a stanch adherent of the Democratic party, sustaining its principles by voice and vote. He married Eliza Dwyer, who was born in Roscrea, County Tipperary, Ireland, and came with her parents to America when a child. Her father, Daniel Dwyer, a native of the Emerald Isle, immi­grated to this country, bringing with him his wife and twelve children, and his mother-in-law, Mrs. Cantwell. 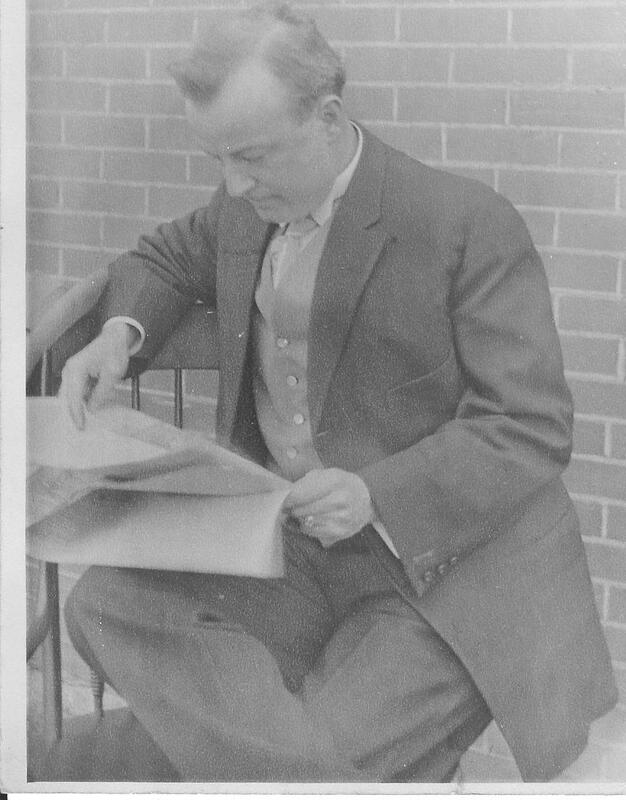 After living for a time in Nash­ville, Tennessee, Mr. Dwyer moved to Franklin, where for a few years he was engaged in mercantile business. From there he went to Louis­ville, Kentucky, and was there a resident until his death. 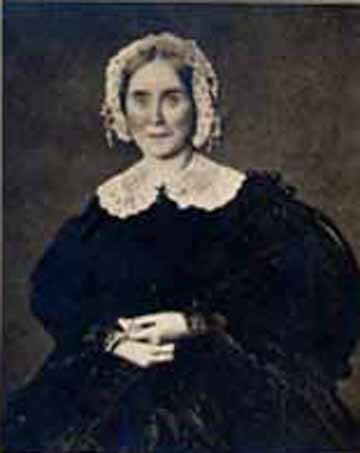 Mrs. Eliza (Dwyer) Philips died at the age of seventy-five years. To her and her husband seven children were born, namely: Milberry, who married William P. Harding; Mary became the wife of John Felix Dc Moville, of whom a sketch appears elsewhere in this volume; Joseph married Annie Cozart; Margaret married Rufus K. Polk; Daniel married Mary E. Finn; and William and Sarah died when young. Daniel Philips, the fifth child, who settled in Nashville, enlisted at the age of sixteen years for service in the Civil war, being commissioned lieutenant in a com­pany of heavy artillery. He was twice captured, first at Island 10, the last time at Fort Hudson, and each time imprisoned on Johnson’s Island, where he was confined as a prisoner until the close of the conflict. His picture at the left was taken about 1861 when he was assigned to the 1st Tennessee Artillery. William Duncan Philips, born about 1862 was the grandson of the William Duncan Philips above and his namesake. I obtained this picture of him from his grandson Chalmers Omberg in 2010. 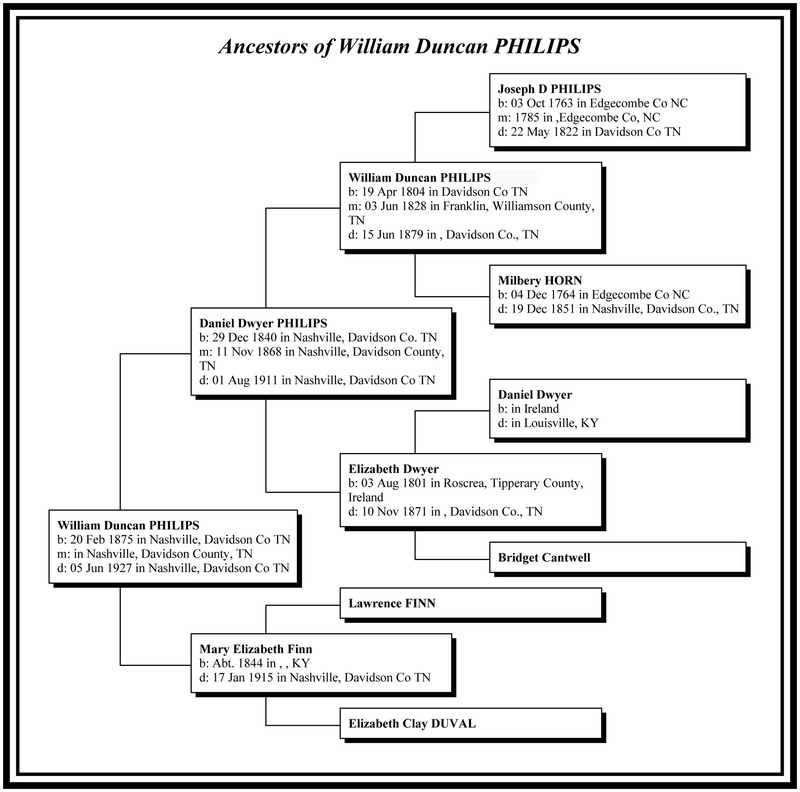 Below is a tree showing some of the ancestors of this William Duncan Philips. The below document was obtained from Helen Philips Omberg's son Chalmers Omberg in 2010 and is an excellent source for information about the ancestors of Joseph Philips' wife Milberry Horn. The following excerpt from the book "It is a Goodly Land" contains information about William Duncan Philips, his father Joseph Philips, and his aunt's husband, Josiah Frederick Williams. The book is a history of Goodlettsville TN and the surrounding area.